Afraid of missing out on the latest photo industry news while you’re out, well, actually taking pictures? Photo FOMO is all the news you might have missed this week, published on the weekends. Alongside the biggest stories of the week, like Panasonic’s new viewfinder-equipped rugged compact, Google’s A.I. update for Photos, and the app that allows photographers to earn cash selling fine art on Instagram, find briefs on the latest in accessories and photo industry news from this week with Photo FOMO. Panorama tools allow photographers to combine hundreds of photos together to create gigapixel landscapes — but what about macro? A group of photographers at the SIGGraph Conference, led by Gene Cooper, recently crafted a macro photo that’s 1053.07 gigapixels or more than a terapixel, a world first for macro photography. That’s 1,053,070 megapixels, enough to print the image as 1/4 mile long and still have an excellent resolution. The image is of a mosaic created with food items, which took five days for the conference attendees to assemble. Combining the 629,370 images along with edits like focus stacking took a total of 2,187 hours — or about three months straight editing without stopping to sleep. The full image is available for scouring online (and above) — and the creators even hid several non-food items as Easter eggs to find. Do your smartphone shots have some wide-angle distortion? Photoshop Express on Android launched a new update this week that will help fix the issue. The app now has perspective correction, which will help mobile photographers straighten skewed perspectives. The update also includes vignettes and adds a tool for sharing multiple images at once. The update is for Android — but iOS users of the app already have access to the vignette and perspective distortion tools. The compact camera market may have stagnated in favor of interchangeable lens cameras, but there’s one camera component that is seeing record sales growth: The sensor. According to IC Insights, CMOS sensor sales are expected to reach a new record high, for the eighth straight year in a row. The growth is credited to the integration of cameras into multiple devices beyond just the typical camera as sensors power machine vision, backup cameras, and self-driving cars, recognition systems and security applications. The sales are expected to grow another ten percent this year after a 19 percent growth spurt last year. Remember the smartphone-attachable cameras like the Sony QX1 or the Olympus Air? Budget camera brand Yongnuo appears to be trying its hand at a similar model. 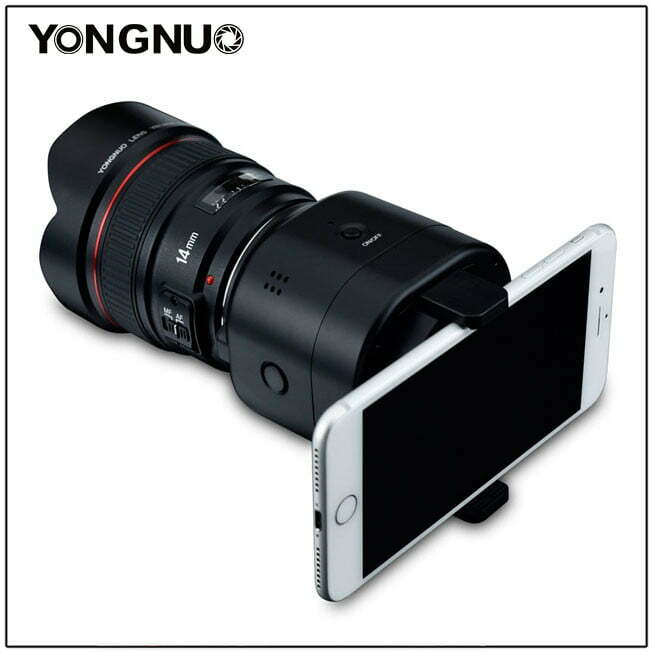 The China-based company recently shared photos of an interchangeable lens camera that sits in front of a smartphone. With only the photos and a name, the Yongnuo YN43, there’s little to determine, exactly what the company is launching or when it will be available. Speculation suggests a Canon EF mount and a Micro Four Thirds sensor. The potential launch is an interesting move from the company. Similar concepts from Sony and Olympus launched in 2014 and 2015 but haven’t been updated recently. The owners of the DxO One smartphone add-on camera, which has a different design but similar concept, also recently filed for bankruptcy.